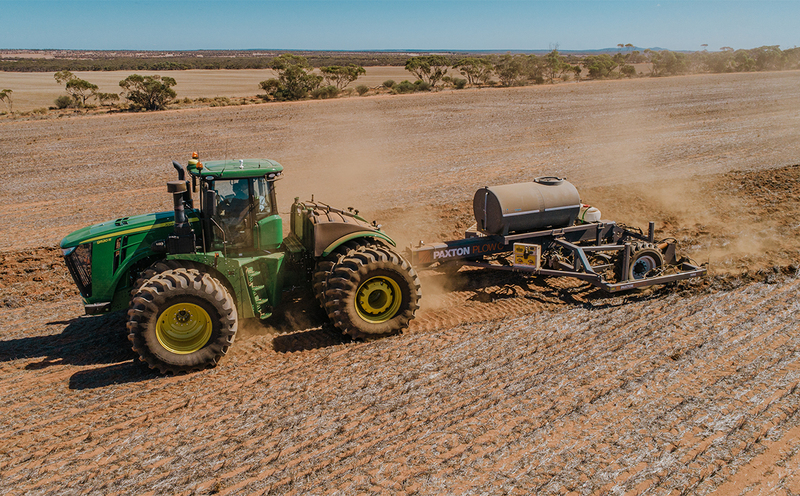 A grower syndicate at Buckleboo on SA’s Eyre Peninsula is breaking new ground with a combined 800ha deep liquid injection trial planned before the start of this year’s seeding. EQUIPMENT: Liquid Systems (SA) Spiker Module, mounted onto the Paxton Plow Soil Renovator. The four growers, who have achieved deep ripping responses such as frost resistance, increased biomass and improved germination, now hope to extend the longevity of these results by injecting liquid nutrients during the ripping process. 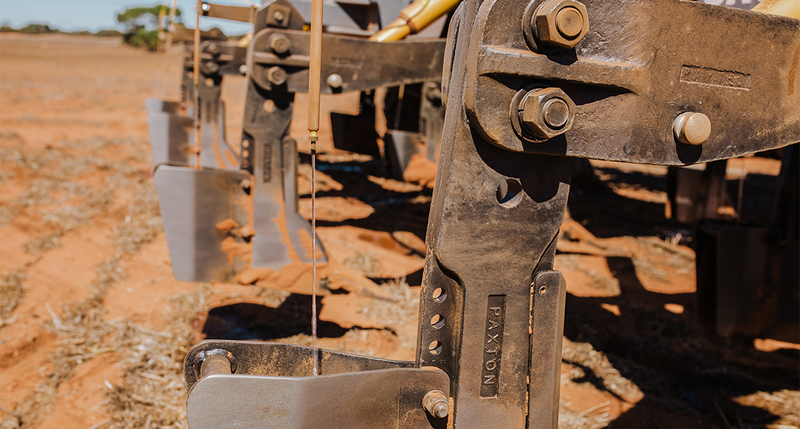 In what is believed to be a first in Australia in a broad-acre setting, the group has mounted equipment from Liquid Systems (SA) onto a Paxton Plow Co soil renovator and will coat the soil with up to 250L/ha of liquid nutrient solution down to 40cm in the profile. Inspiration for the project came from the growers’ involvement in the Buckleboo Farming Improvement Group (BFIG), which has experimented with 15 different subsoil treatments during the past four years. The group created a fully replicated trial site to test deep ripping, delving, spading and combinations of added nutrients. Due to hostile subsoil with high concentrations of boron in the district, deep ripping with a Paxton shank was found to be the best solution as it fractured the soil but didn’t lift the boron to the surface. However, the next step was finding a cost-effective way to add nutrients at depth, which led former agronomist and syndicate member Tristan Baldock to consider liquid injection. “I started to think that if we’re going to get permanent change and make the most of the ripping process, we need to create an environment that facilitates rapid root development at depth,” he said. We need to grow rooting channels in the first two years before the soil settles back down. The BFIG trial showed that there’s a benefit from applying organic matter at depth, but that’s expensive both in terms of freight and in application technology. 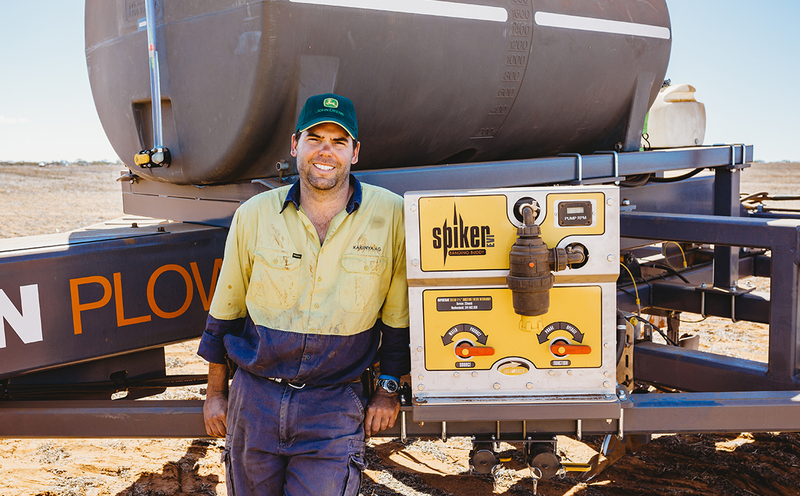 While BFIG trialled adding fluid gypsum at depth about two decades ago, Tristan believes injecting liquid nutrients at depth could be breaking new ground. “ This has been done overseas in other settings, but from what we can understand, it’s a first in Australia from a broad-acre sense,” he said. There’s not really a reference that we can go by, but the theory is sound. Through ripping, we’ve opened up the bucket for the plant to access, now we just need to make sure we feed the plant as it accesses that bucket. The syndicate purchased the 6m-wide soil renovator in late 2018 and fitted it with a Liquid Systems (SA) Spiker Banding Buddy with 13 terminal outlets mounted on 13 tines, at 450mm spacings. While they are still researching and developing the liquid mix, they plan to inject the trace elements zinc and copper as well as phosphorous and possibly potassium, which will coat the soil as it funnels down the back of the trench via an inclusion plate, which is bolted onto the ripping tine. The process will fracture the orange sands in the 10 to 40cm profile, incorporate the nutrient-rich grey top soil at depth, while coating the combined soil with liquid nutrients. “While we’ve got this relatively active soil in the zero to 10cm range, the roots can’t push through into the orange sands, which is a massive bucket of water,” said Tristan. If we can get the roots down there, then suddenly we’ve doubled or tripled our bucket, which is crucial in a low rainfall environment. With help from Liquid Systems’ founder Peter Burgess, the syndicate has designed the liquid set-up, which includes a cone-shaped nozzle that is fitted behind the tine and above the inclusion plate in order to provide maximum coverage of the soil as it folds into the trench. This is different to in-furrow liquid injection, which is applied as a stream. The amount of liquid the syndicate plan to apply will also be different, with approximately five times more liquid injected into the ripped trench compared to in-furrow. “Once upon a time I thought roots sought out nutrients but that’s a load of rubbish. They seek out water, so you need to make sure your nutrients are nearby. The amount and type we’re using is going to be trial and error, but we have to start somewhere,” said Tristan. “We know we get a response from deep ripping. This year in our lentil crops where we had ripped, we didn’t get frosted. We had about double the biomass in the ripped zone which means the roots obviously tapped into the bigger bucket, so it was healthier and able to self-regulate when the frost hit. So injecting liquid nutrients is about maximising the value we get out of that ripping. If we can make the roots go absolutely nuts in the first couple of years, then we’ll be able to create the root architecture that’s needed for the response from the ripping to last longer. The grower syndicate plans to commence its trials in February 2019 and together with Liquid Systems (SA) will report on progress and results throughout the year.